Manila, Philippines - Tropical Depression "Caloy" has weakened into a Low Pressure Area (LPA) after made landfall in Surigao del Sur, PAGASA announced through 5:00PM bulletin on Saturday, March 22, 2014. At 4:00PM today, the Low Pressure Area (LPA) was estimated based on all available data in the vicinity of SURIGAO CITY (9.7ºN, 125.3ºE). PAGASA said that all public storm warning signals elsewhere are now lowered. "With this development and unless re-intensification occurs, this is the final bulletin on this weather disturbance. 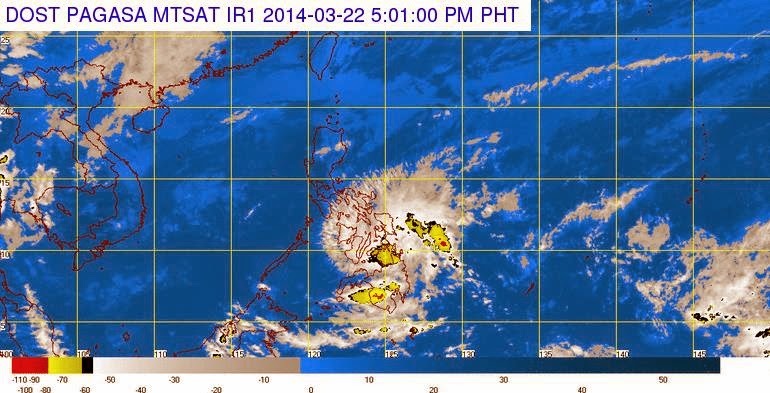 ", PAGASA said on its bulletin. Eastern Visayas and Caraga will have cloudy skies with moderate to occasionally heavy rains and thunderstorms. Bicol region, the rest of Visayas and of Mindanao will experience cloudy skies with light to moderate rainshowers and isolated thunderstorms. Cagayan Valley and the province of Aurora will have cloudy skies with light rains. Metro Manila and the rest of Luzon will be partly cloudy to cloudy with isolated light rains or thunderstorms. Moderate to strong winds from the Northeast will prevail over Luzon and coming from the Northeast to North over the rest of the country. The coastal waters throughout the archipelago will be moderate to rough.